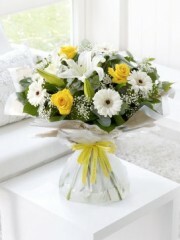 Send your congratulations in style with this bright and sunny bouquet. 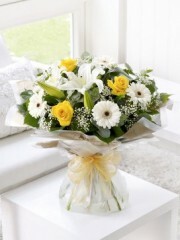 We’ve carefully hand-tied a selection of white lilies and germini and added radiant yellow roses for a perfect contrast. 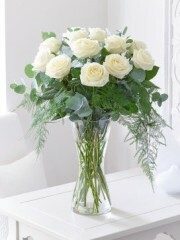 Tiny white gypsophila flowers give this gift an extra touch of magic. 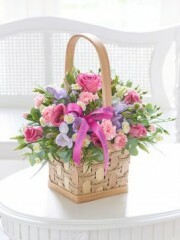 Send a birthday gift that looks and smells delightful and they’re sure to be impressed with your choice. 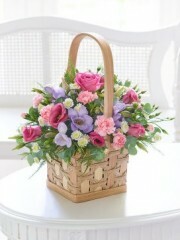 This charming basket is a beautifully arranged selection of delicate pink, lilac and cream flowers – and the soft fragrance is thanks to these gorgeous freesias. Perfect! This gift is designed to impress. 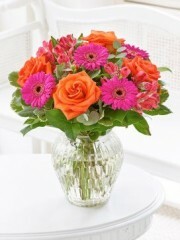 Vivid orange roses, neon pink germini and glowing cerise alstroemeria are a sensational combination of intense colour and glorious natural beauty. 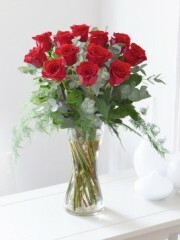 It’s the perfect way to prompt a radiant smile of delight. 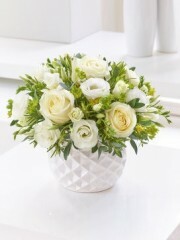 The smooth velvety texture of these exquisite ivory roses is complemented perfectly with the more delicate, paler shade of the white lisianthus. 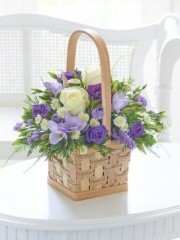 Freesia, rosemary and eucalyptus give this gift a wonderful scent. And we’ve also added hints of warm yellow for extra depth and detail. 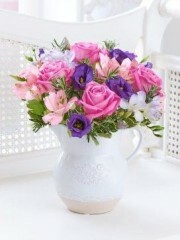 Top Rated By You consists of products that are undoubtedly your, the customer’s, chosen favourites as these floral designs have proven to be popular time and time again. We decided to create this particular floral collection to help make it a little easier for you to find the exact bouquet or arrangement you are looking for. Many of our best sellers reside here waiting for you to click the BUY NOW button. 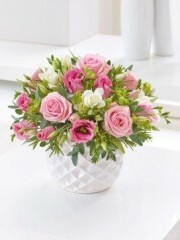 This collection includes the favoured vibrant hand-tied bouquets; the pink radiance design; cream exquisite arrangement and, of course, the heavenly rose hand-tied amongst many others. This category can also come in handy for those who are unsure of what to order as these designs are universal and suitable for any and all occasions ranging from birthdays to new born baby events and everything in between. This collection has been put together for your convenience, giving you a better experience as you browse through our website in search of what you are looking for. Up on the Edinburgh flowers website, you can see for yourself the diversity of the top rated by you category which the talented Edinburgh florists have already arranged. 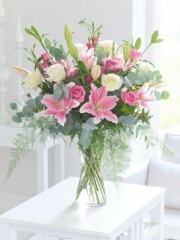 This selection - as well as all the others offered by Edinburgh flowers - is composed completely of premium quality flowers which have been cultivated in the prosperous fields of Holland. Holland is a region of the Netherlands renowned for growing some of the best quality flowers in the world so with Edinburgh flowers you can be rest assured in the knowledge that you won’t receive anything short of perfection. 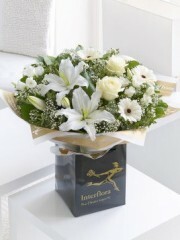 We at Edinburgh flowers want nothing more other than to provide customers with the best possible service which is why we want to offer you as many options as humanly possible so you are spoilt for choice and are able to find something simply perfect for your recipient. 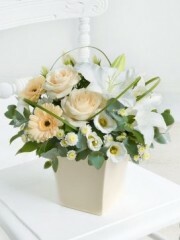 In addition to providing customers with gorgeous floral designs, Edinburgh flowers also have a gifts range o offer which is versatile and like our flowers, suitable for any and all occasions. This gift range includes mouth-wateringly delicious chocolates which simply melts in your mouth, the ideal gift for a loved one with a sweet tooth; adorable teddy bears which are silky soft and come in a variety of different colours, perfect for any occasion in relation to children such as birthdays and new born baby occasions. There is a selection of delectable champagnes and wines - including red, rose and white - all rich in taste on offer at Edinburgh flowers. Both these beverages are widely recognised as celebratory drinks so they are perfect for any occasion also from a wedding anniversary to a romantic dinner; gorgeous candles are also available which are the perfect home decoration; fruit baskets in varying sizes which the Edinburgh florists arrange artistically, full to the brim with sumptuous, fresh fruits as well as balloons. Upon request, the Edinburgh florists are able to arrange charming balloon bouquets which usually consist of three blank balloons and three fitting for your occasion. Hopefully these gifts will be able to make your recipient feel that extra bit special and thought of on this special occasion. 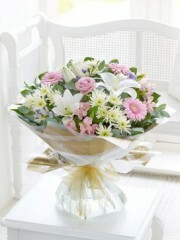 You are also able to further personalise your order by sending a personalised card message alongside your flowers and gifts. No matter what or how big or small your request is, Edinburgh flowers will aways do our absolute best to fulfil all your floral wishes.